HERE IS HOW WE MEASURE: AGAIN, DO NOT MEASURE YOURSELF. ONLY MEASURE A SHIRT OR VEST, BUTTON DOWN ONLY. Measurements are taken in inches, under the arm pits, from seam to seam - across the back of the vest only, NOT ALL THE WAY AROUND.Please take measurements for an exact fit. 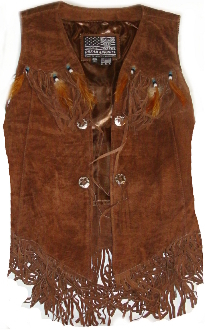 MEASUREMENTS From top to bottom INCLUDE FRINGE. before you have measured a shirt or vest of your own. DO THE SIZE COMPARISON AS LISTED IN INCHES OF THIS VEST. NOTE: THESE ARE REAL FEATHERS.